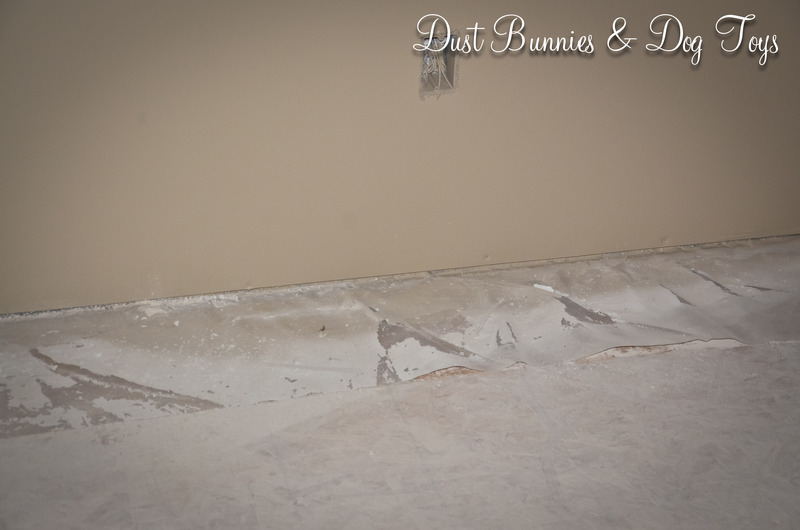 We replaced the OSB that was in place, as it was already bowed and starting to chip on the edges. Instead we used a solid piece of plywood which hubs cut to size and glued flooring planks to. Next he carved out a spot for the handle, so it would be recessed on the panel. Smart thinking since it will be underfoot everyday in our closet. Although the covered panel blends in, the lip that it sits on was still visible and exposed so we decided to add some trim to the edges. We got some threshold molding from the flooring store where the builder ordered our flooring material and miter cut it to fit the square. We didn’t need the extra strip of foam on the bottom since we weren’t using the pieces for a raised threshold, so hubs just sliced them off. Without the extra strip of foam on the bottom the pieces lay flat on the panel which is what we want them to do. That will allow them to overlap the exposed lip gap, which is at the same level as the panel. 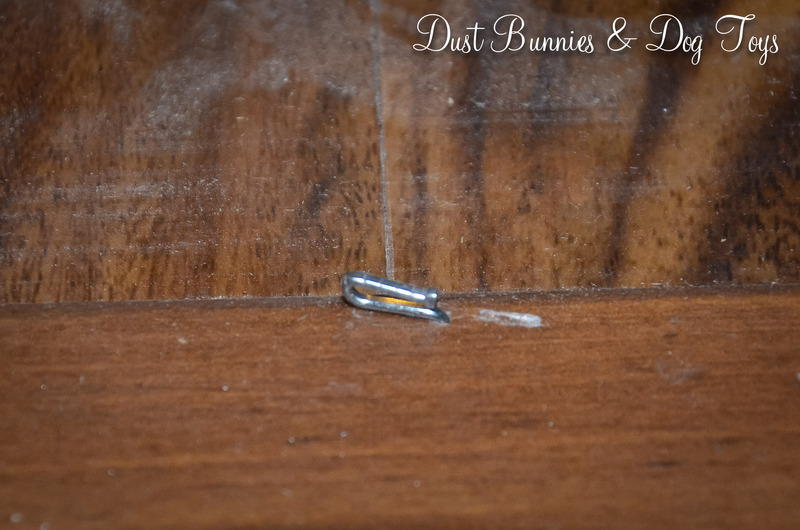 We planned to use both wood glue and small finishing nails, but the nail gun jammed and then malfunctioned, making the nail look more like a staple, so we decided to just use wood glue and clamp everything together. 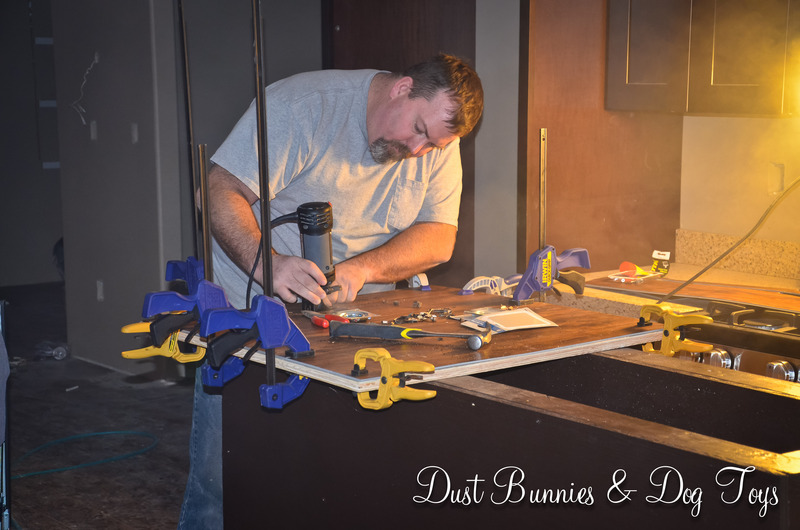 Notice the builder’s mess surrounding our project? That’s just part of what I described in my post the other day. It seriously makes me itchy, but I’m overlooking it because I know it means progress is being made. 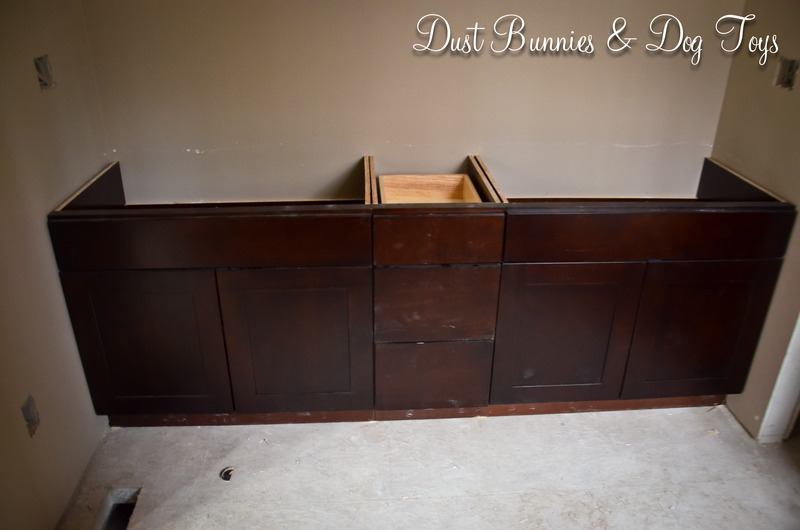 Our First Offical New House DIY Project! 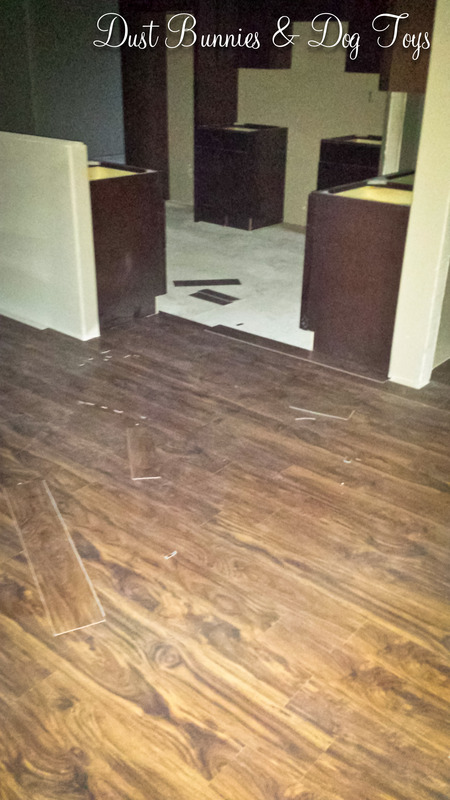 I promised a post about our flooring installation, so here it is. It’s been a little slow going because we can only go to the house in the evenings after work, but we’ve made pretty darn good progress in just 3 days. 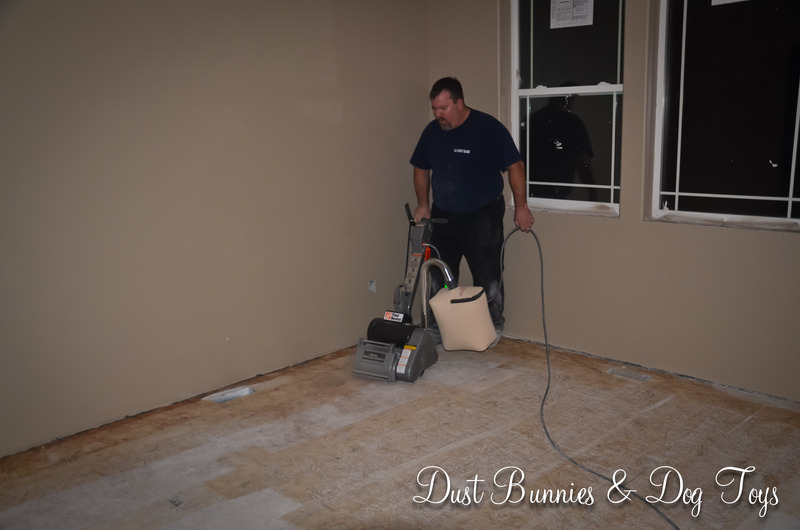 The first night we rented a drum sander from Home Depot and sanded all of the subfloor joints and any spots that had high spots from other portions of construction. 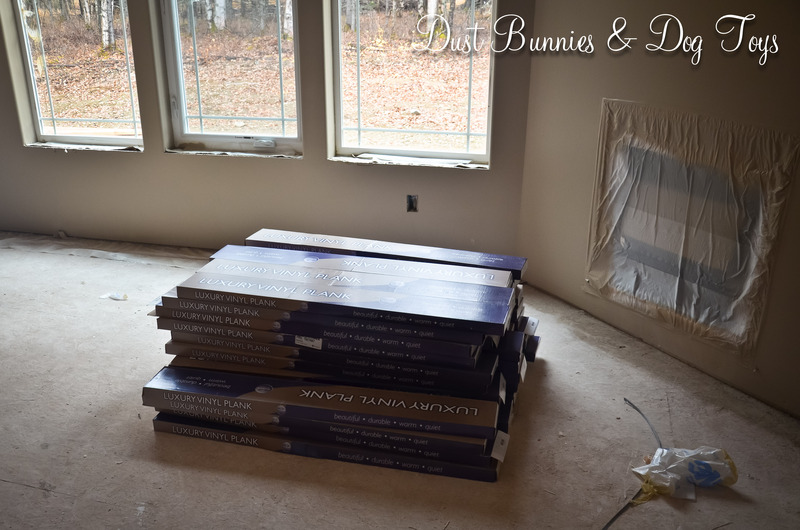 Of course, prep work begets prep work and before we could start sanding we had to cut off the excess plastic sheathing installed on the exterior walls as part of the energy efficiency, which you saw in this post. This stuff was applied with a super sticky and gooey tar-like substance that has been very annoying to clean and work around at the base of the walls. 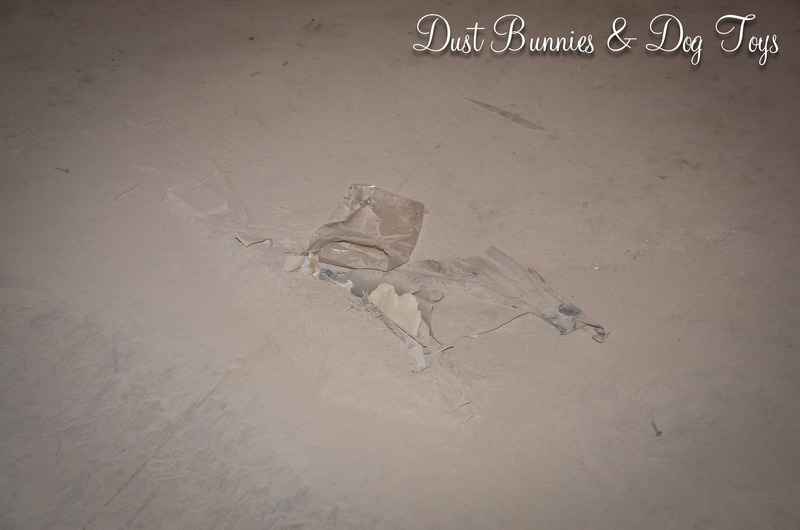 We could have laid the flooring over top of the portion on the floor, but with all the paint, mud and texture residue on the plastic it just wasn’t a good idea, especially since the flooring warranty could be voided if there is any under layment. 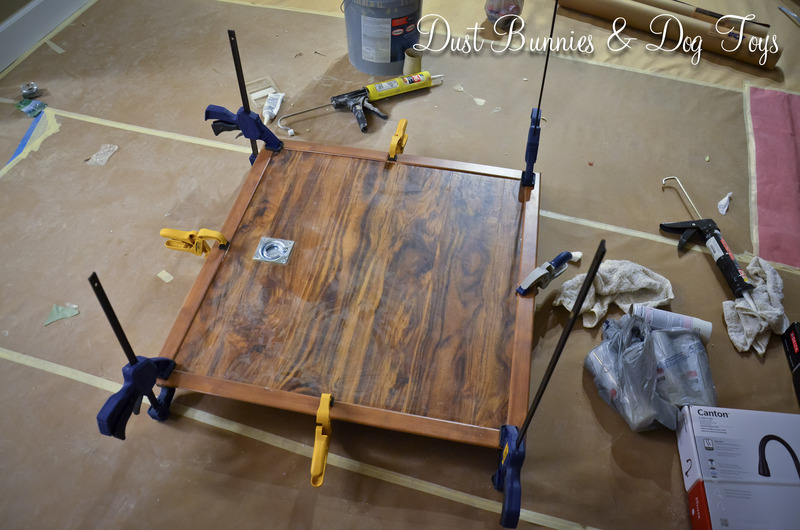 Once the floor was vacuumed, the hubs started sanding. 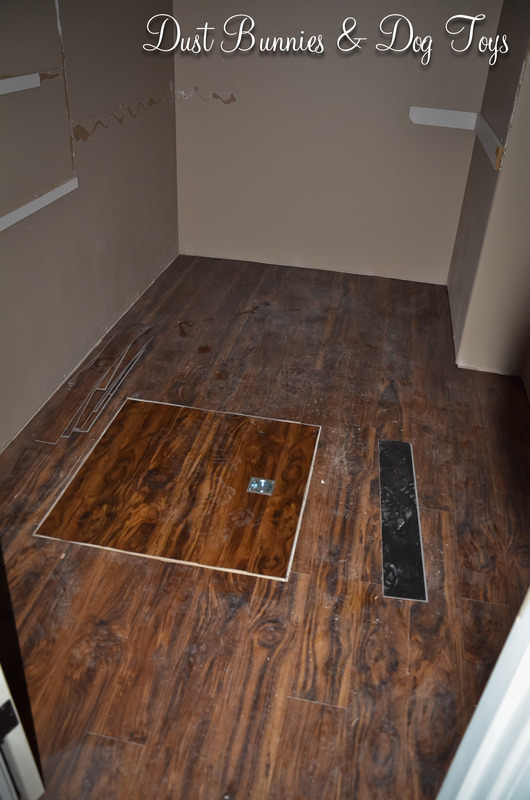 At first he did the whole area but we soon realized that wasn’t necessary so he focused on the seams of the subflooring and anything that had a high spot. We started installing the next evening. Each piece has a tongue and groove edge so that it locks into the piece next it on either side without use of any adhesive. 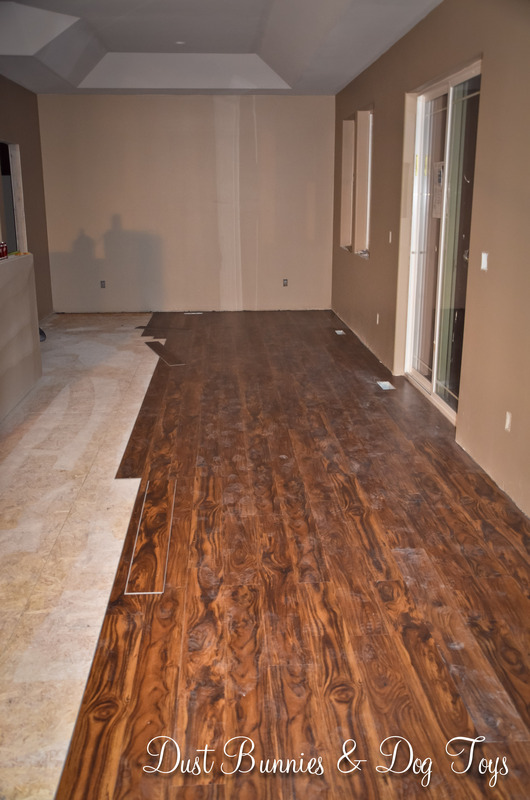 And without need for an underlayment, it can be installed right over the subfloor, as we did. It took us a while to find a ‘system’ with the material, but once we did it went fairly smoothly. The hardest part was getting those first few rows down so there was something locking the other pieces into place. There’s been a slight learning curve and a few ‘dang it’ moments, over all we’ve not had any major hang ups. Here’s what things looked like near the end of the first night of installation. 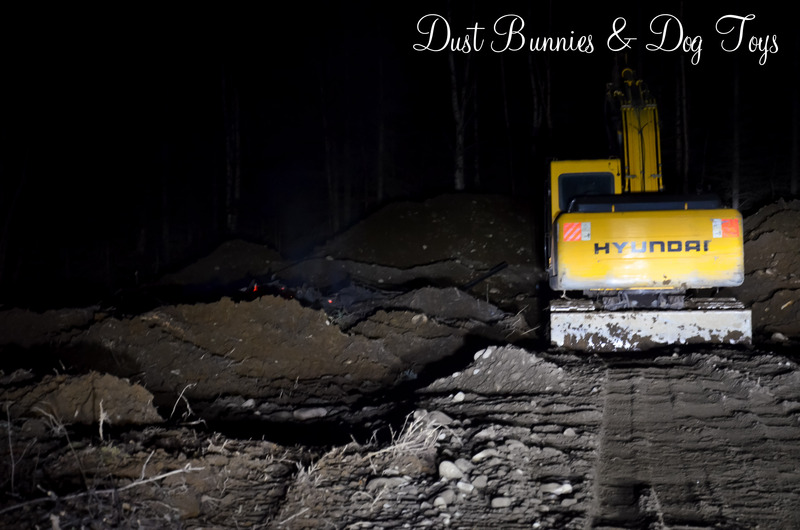 We had the dogs with us while on site and were pleased that they stayed out of the way for the most part. Granted that’s likely because they’d been to Doggie Day Camp and the groomer that day, and were just plain tuckered out. Sangria decided she’d hide out in the pantry since it was the one area we weren’t walking through. The hubs had a light schedule at work today, so he left early to go work on the flooring without me and spent most of the day there. He made pretty good progress, including some difficult ‘tight spot’ pieces that took extra time to cut. Here’s what it looks like now (sorry for the phone pics, but it’s all he had with him, since the ‘photographer’ wasn’t around). Dining room done into the laundry room and the edge of the kitchen. Great room fireplace wall done. Unfortunately we got a call from the flooring store saying there was some ‘mix up in Seattle’ and the other half of our flooring wasn’t shipped until TODAY! It was supposed to already be here, so this is quite a set back. It’s now supposed to arrive Monday or Tuesday and then has to sit on site for at least 1 day before it can be installed. We’re not sure yet how the will impact the overall completion schedule, but we’ll continue working with what we do have until we run out in an effort to keep things as on time as possible. As anticipated the November 1 closing date has come and gone without the house being ready. We’ve signed an amendment to extend the deadline, but it’s still going to be tight to get everything done. 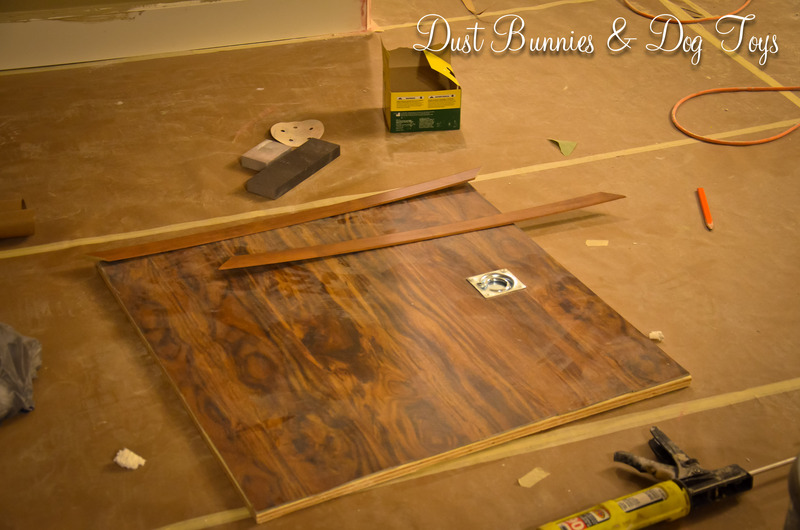 The hubs and I went to sand the sub floor in preparation for installing the flooring on Saturday, but found painting and cabinet installation in full swing when we arrived, so we weren’t able to get anything done. We did unload the half order of flooring the vendor had in stock so it could acclimate on site for the recommended two days. The remainder should arrive tomorrow or Tuesday, so we’ll have to let that acclimate on site as well before installing it. We had a meeting with the foreman and the realtors today to go over the timeline for the new closing date of December 1. 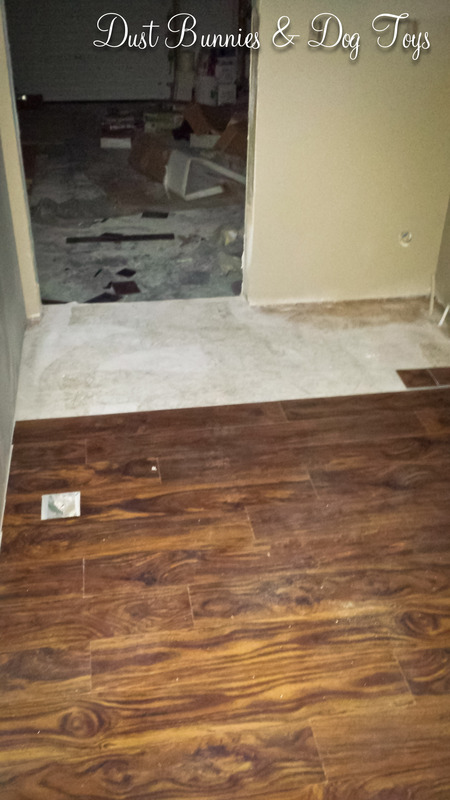 We will work on the flooring every evening this week, and the master bathroom tile should be installed in the next few days so we can finish flooring around that at the end. 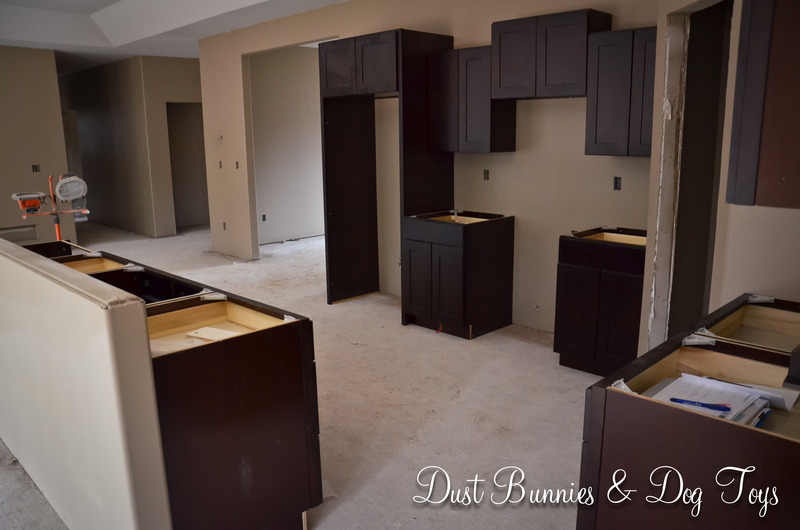 Then the following week all of the finish work will be done – trim, doors, electrical outlets, paint touch up, etc. The should put us at 95% complete for the appraisal the week before Thanksgiving. 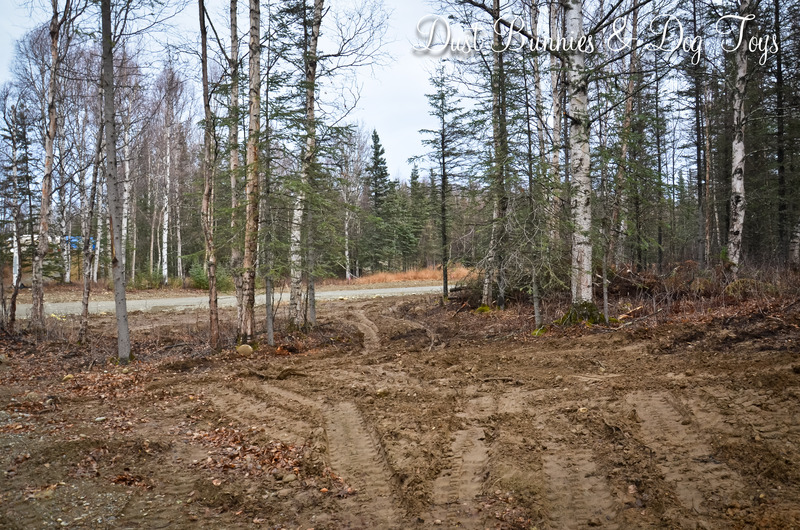 The power line has finally been installed, so there is electric to the house now. They ended up having to take a few more trees out at the end of the driveway to run the line, but getting power to the house is worth it. You can see the small green box to the side of the house. That’s our electrical pedestal. 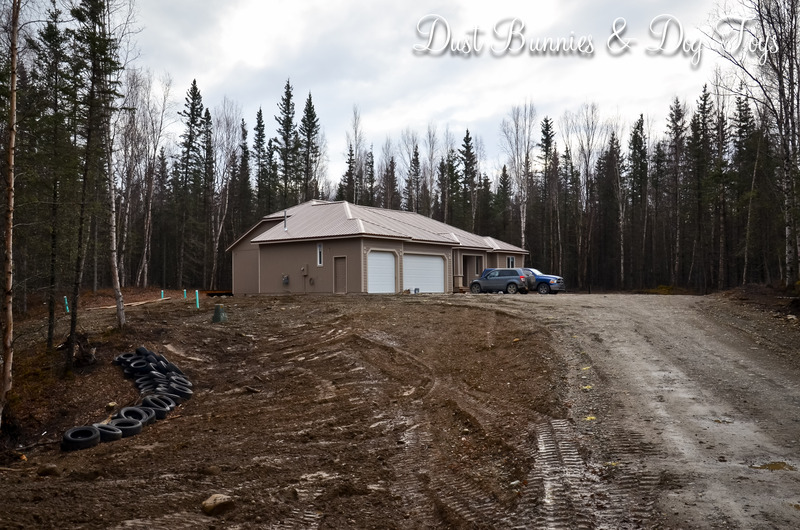 That side of the house is getting pretty crowded with pips and utility features, so I’ll have to figure out some landscaping beyond my rain garden (which will have a retaining wall made from those tires) to hide them next season. Inside, things are finally starting to look like the finished vision we’ve had all along. 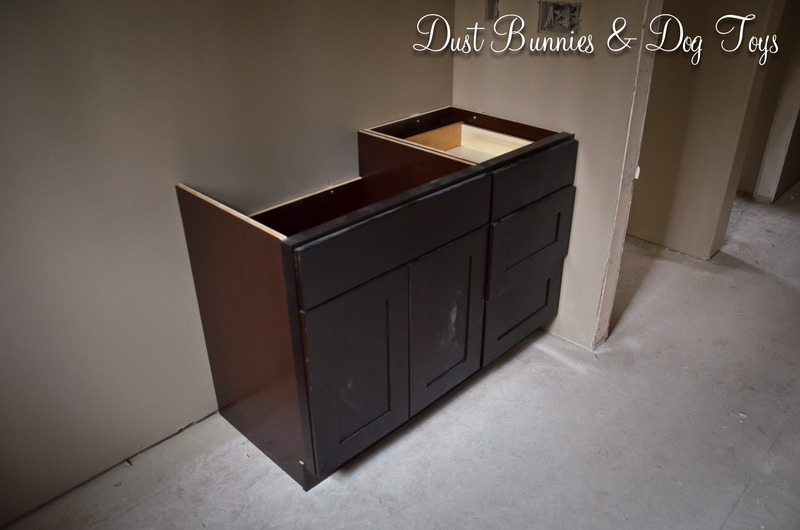 The cabinets look great with the paint color and the tile coordinates perfectly as well. Hopefully I’ll have pictures of that later this week, once it’s installed. 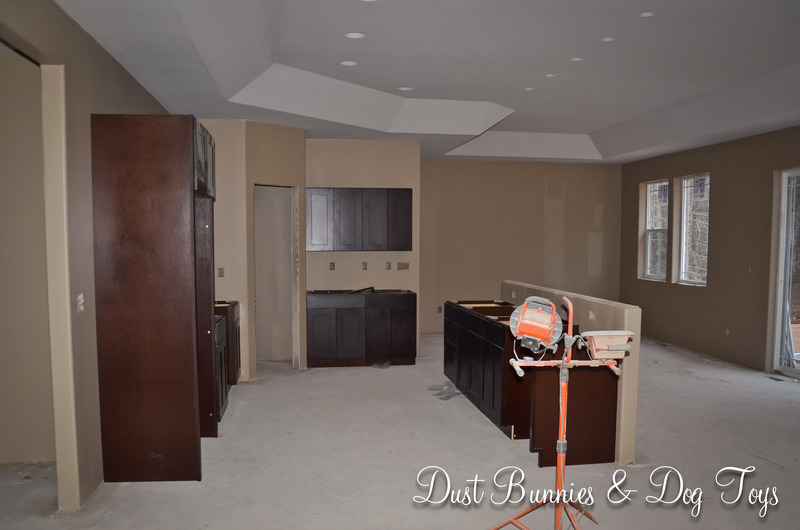 The counter tops are on-site and ready to be installed once the final tweaks are done on the cabinets. 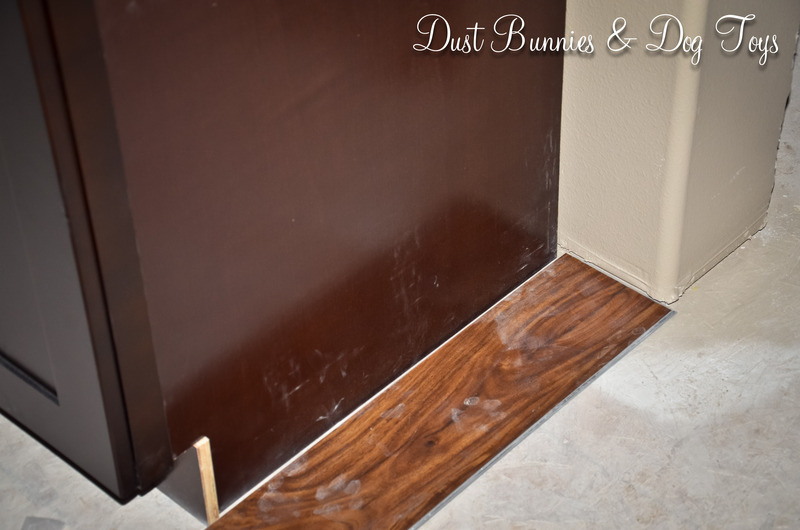 I tested out the flooring next to the cabinets just to get a feel for it, and I’m pretty happy – even with the dusty paw prints! I plan to attempt documenting the install over the course of the week and share that, so stay tuned! 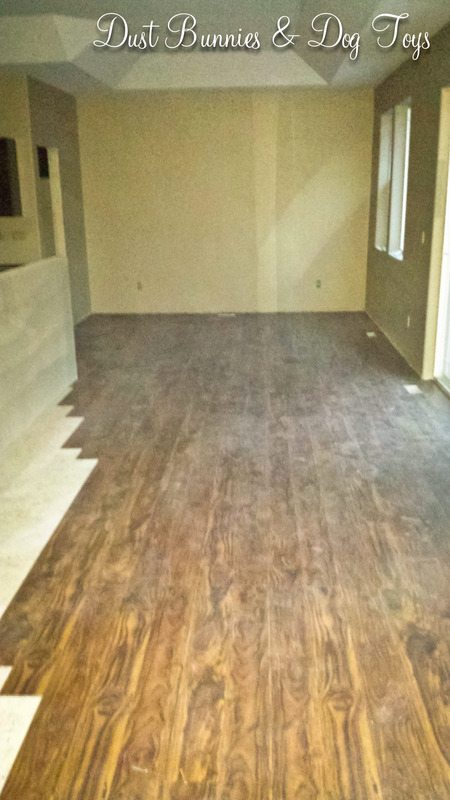 Unfortunately, the Traffic Master Allure Ultra flooring I described in this post came in a little more over budget than we were willing to stretch so we decided to keep looking at options. Good thing we did because we soon learned that Traffic Master isn’t the only company with a product toting these features. 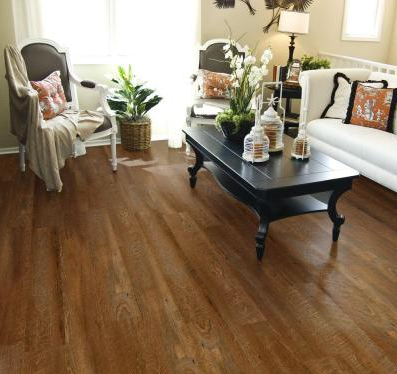 Apparently Shaw Flooring has a ‘luxury vinyl plank’ that is essentially the same product with the same installation and guarantees, but at a price that comes in right AT our budgeted allowance! 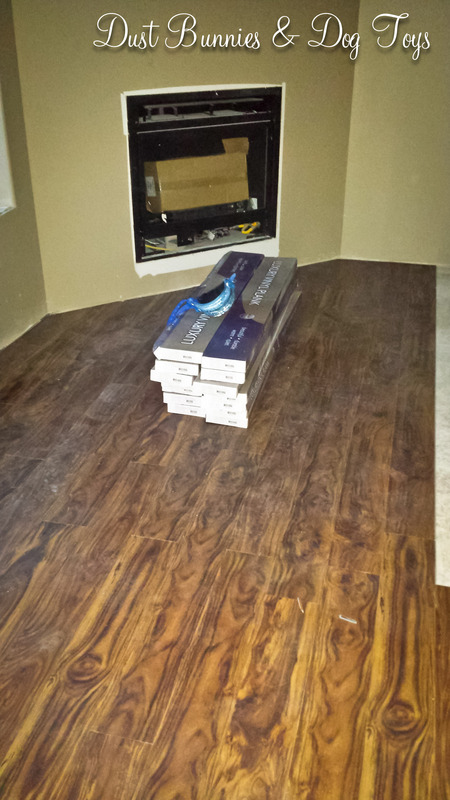 And even better is that the flooring vendor our builder likes to go through carries the product in-stock. Granted he will have to place an order to provide enough material for our whole house, but he said that wouldn’t be a problem with enough advance notice and since we’re still at the framing stage I think we’ve got a little leeway still. We chose the Northampton Cascade Acadia which has a variety of tones that will play well off our darker cabinets and leather furniture. 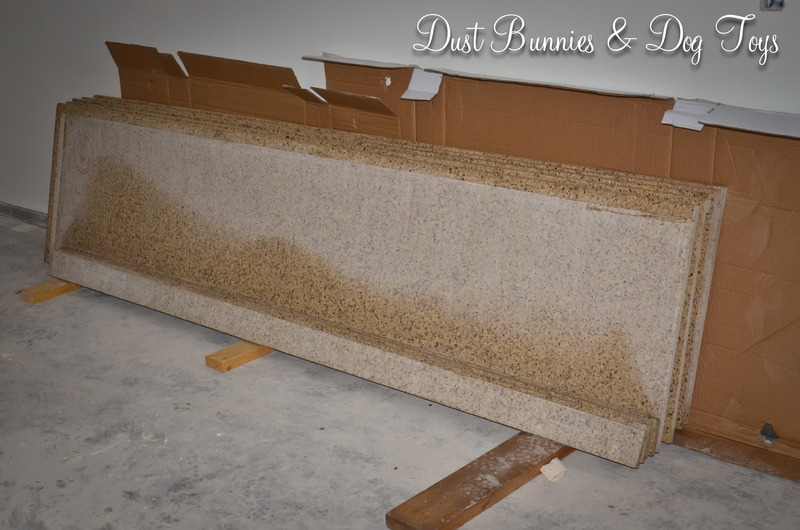 It’s a little different than the Allure Ultra we picked out, both in color and texture, but I like that it looks more like real wood than the Allure does and less texture means less hiding places for dirt and dust which trigger my allergies. 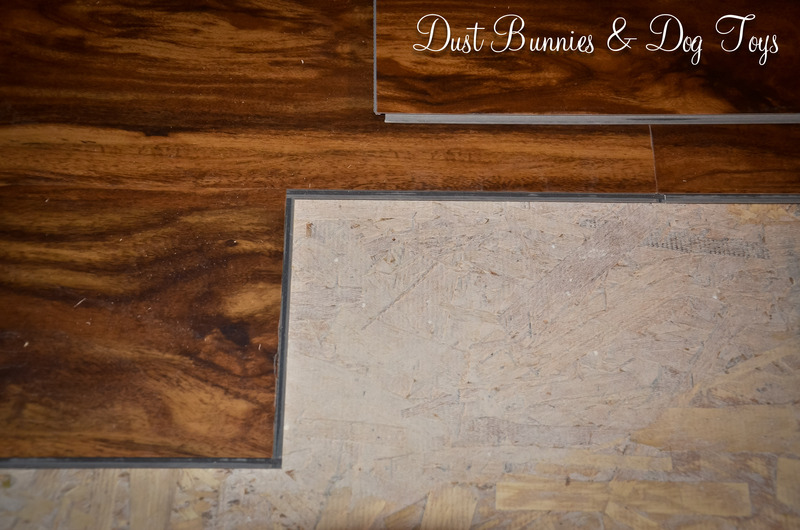 As promised, here’s a little run down of the flooring we plan to use throughout the whole house. 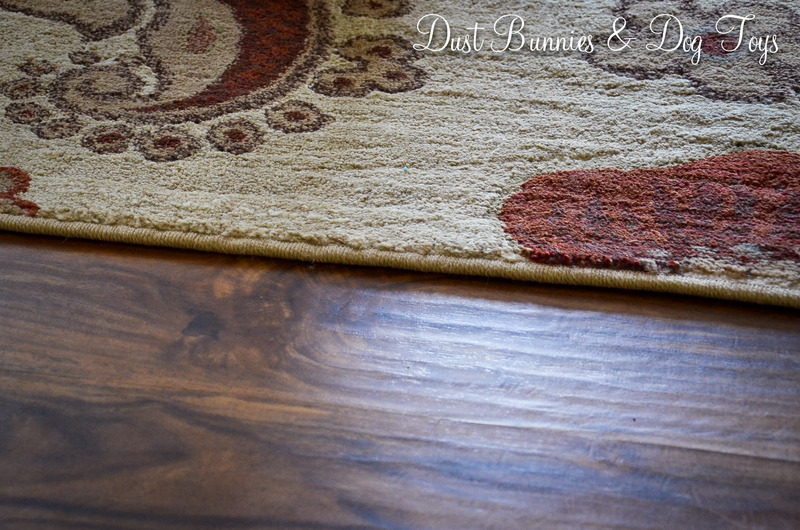 I knew I wanted wood floors because not only do I love the way they look, but they are easy to clean and should be better for my allergies than carpet. 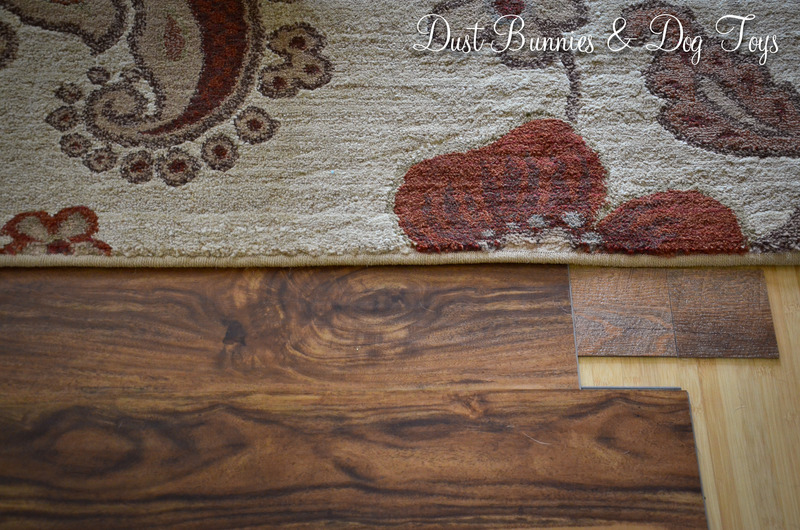 The hubby had laminate floors in previous homes and was adamant that we would not use a laminate because of the issues he’s had with them, so we started looking at hardwood and engineered hardwood products. 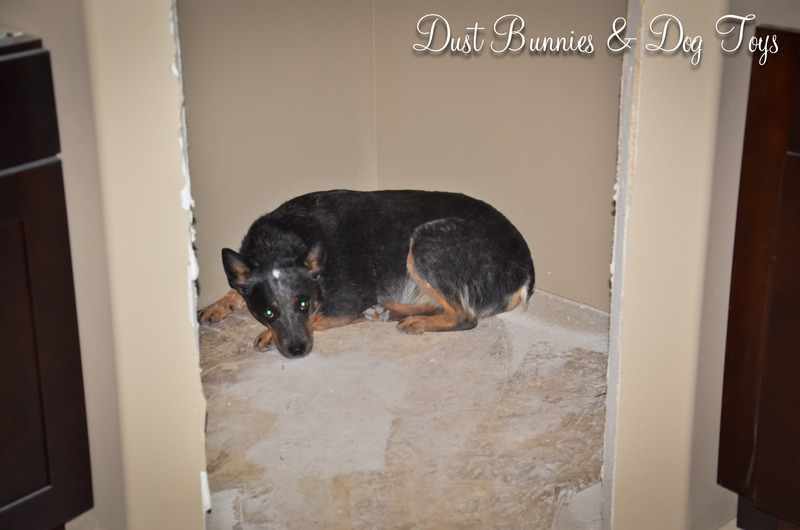 We found several that we loved the look of, but were completely beyond our budgeted allowance with the builder and just wouldn’t stand up to our rough and tumble dogs. 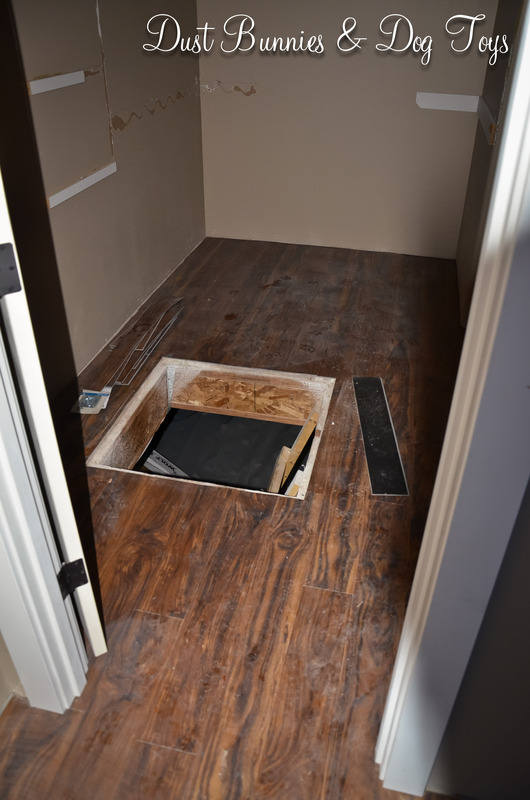 Plus they wouldn’t work in areas like the kitchen, laundry room and bathrooms, which meant we’d have flooring transitions – something we were trying to avoid whenever possible. 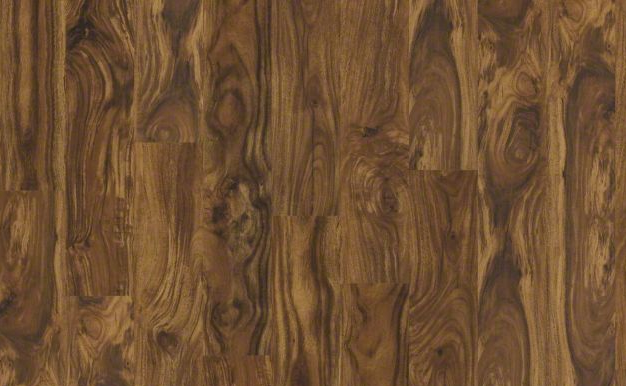 During one of our ‘research’ trips to Home Depot I spotted a new tile product made to look like wood floors and asked an associate about its durability. When I explained what we wanted he asked if I’d see the new Traffic Master Allure Ultra Flooring. We hadn’t, so he took us to the display and explained how easy it was to install (click & lock with no under layment necessary) and how resilient it was – water proof and scratch proof. Click here to view a video about the product, describing all of it’s attributes and installation. The store associate also mentioned that he was about to install it in his own home and that his manager had also used it in his home with great results. That made us even more interested, so we took a couple of samples to see which we liked best and test them out under doggie feet. Because both samples held up perfectly to the dogs’ attacks, the hubs decided to give it a little extra testing and actually took a key to the sample we liked best trying his hardest to get it to scratch. When that didn’t produce any real visible result he moved on to testing with a very sharp knife, which finally did have a result, albeit minimal. The scratch was minor that you probably wouldn’t see it from a standing height when it was on the floor. That was the critical selling point for us. 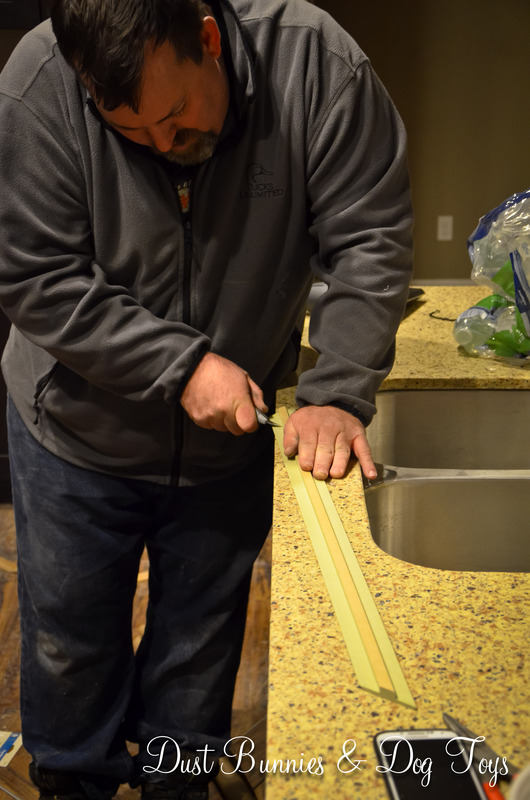 Adding in that it was comparably priced to the end cost of a laminate or tile once you factor in the extra materials needed for installation sealed the deal. Then we learned that because we would be installing it in a residential home there was a 25 year warranty. Plus because we plan to use it throughout the whole house there will be no transitions! I don’t think we could have asked for a better product.